Now that we’ve considered hierarchies, let’s look at five apparently universal evolutionary and developmental goals (behaviors, purposes, drives, challenges) we can observe in all complex adaptive systems, in any of these five hierarchies. We’ll return to these five goals at many points in the Guide. In my view, these five goals tell us a lot about the nature of successfully adaptive complex systems. They allow us to say many more specific things about the nature of both individual and universal progress, beyond the observation that the emergence of technological life seems a natural next step for local intelligence. I call these the Five Goals (behaviors, purposes, challenges, drives) of complex adaptive systems, and abbreviate them I4S, after the initials of the first words in each category – Innovation, Intelligence, Interdependence, Immunity, and Sustainability. I4S offer a particularly universal perspective on the goals of complex adaptive systems, in my view. Can you propose another adaptive life behavior that doesn’t already fit into these five categories? Do any of these not seem truly fundamental to life’s adaptation to its environment? To my thinking, all five seem critical. Together, I believe they offer a good general definition of the various forms of collective intelligence of life. With some oversimplification, we can classify two of these five goals as primarily evolutionary, and two as primarily developmental in nature, and one as an evo devo mix, as we have done in the color scheme above. Recall that evolutionary processes are most essentially about new information production and simulation (computation). They are divergent and creative, involving universal informational processes. Developmental processes are most essentially about old information conservation and the predictive protection of critical dynamic systems (immunity and homeostasis). They are convergent and predictable, involving stable universal physical processes. We can depict the centrality of interdependence in a cartoon Gaussian curve, as we have done at right. Thinking of these goals from an informational standpoint, consider that all living systems must continually balance unpredictable information production (Innovation) and predictable information conservation (Sustainability). These goals are fundamentally in tension with each other. Thus it is helpful to depict them at opposing tails of an evo devo purpose, goals, or telos dichotomy. The goal pair of Innovation (aka tree-like Divergence and Variety/Information Creation), and Sustainability (aka funneling Convergence and Critical Information Conservation) can be considered the two most fundamental processes of complex systems–the creation of things that don’t exist, and the maintenance of things that must stay the same. Intelligence and Immunity are also in tension with each other, but not as obviously. Intelligence depends on prediction (development), but it is primarily evolutionary (increasingly unpredictable, and options-, divergence- and variety-generating) as a process, as the 95/5 Rule reminds us. Immunity also uses and depends on evolutionary creativity, as we see in genetic polymorphism, HLA gene recombination, and even the production of antibodies, but it’s is primarily developmental, as it most centrally seeks to predict danger and to protect the life cycle of the organism. Only Interdependence seems an equal balance of both evo and devo goals (telos). We have colored it purple above to indicate its centrality to adaptation. From an evo devo perspective we can argue that the most central kind of adaptiveness is not individual intelligence, which is useful but often divergent, and it is not the rules and laws that are there to protect us (immunity), but rather it is both the management of feelings (emotions, empathy, love) between interdependent systems, and the rules of interaction (morality, ethics, positive sum games) between interdependent systems. In other words, when we look at interdependence from one apparently fundamental sense, that of emotions, or the heart, we can say philosophers and theologians have been right when they tell us that the growth of love or empathy is a central purpose of life. We can think of these attributes as the glue, or informational force, that holds together all complex living collectives. When we view interdependence from another apparently fundamental sense, that of cognition, or the mind, we can see that it is actually a form of collective intelligence. Interdependence includes our group norms, ethics, and morality, and the rules under which we link together and form “superorganisms”. This ability to form in-groups, of three or three billion, is one of the most adaptive and powerful, yet also potentially dangerous and discriminatory, things that human beings instinctively know how to do. Today’s youth are clearly more intelligent, by some measures, than their predecessors. The well-known Flynn effect documents the long-term increase in average IQ test scores from 1930 to the present day. I am convinced they are also significantly more interdependent (ethical and empathic) and globally minded than their predecessors. Intellectuals like Simon Sinek like to critique them, calling them “a generation of weakness“, but I think he misunderstands them. They are more concerned with ethics, empathy, and safety (immunity) than previous generations, as those cultural intelligences have continued to grow, as our world gets ever faster and more powerful. Development problems and plutocratic regressions aside, we live in a far better and more I4S empowered world today than our parents and grandparents, and are on the precipice of a vastly more empowered and interdependent future. Among their biggest problems today’s youth suffer with is particularly poor social contract and economic prospects they’ve been handed by comparison to their parents, due to the accelerating plutocracy of the last fifty years, and its marriage to continual workforce automation in most developed countries. They also have to suffer the distractions, manipulation, and addition potential of a first-gen, unintelligent digital media. But once personal AIs (PAIs) arrive, as discussed in Chapter 8 (Your Digital Self) education of the average citizen will no longer be a function of the state, the plutocratically-owned media, or even today’s dumb and profit-oriented social networks. We’ll all be educating ourselves and each other, via our PAIs and the values-based groups (groupnets) they will enable. Think for a moment about how I4S empowered the next generation of PAI-assisted children will be, starting in the 2020s, and particularly in the 2030s, as PAIs get smart. Pessimism about our global prospects is a luxury of those who want to scare us into positive change, but the reality is, accelerating positive change is coming for us all. We just need to better see it and guide it, so we can get out of today’s flatlands into a truly fantastic future. Let’s dig a bit deeper into all five of these goals as forms of intelligence. In living systems, we have genes that create diversity under stress (Innovation intelligence), genes that cause us to simulate the world (Intelligence intelligence), genes that make us empathic and ethical (Interdependence intelligence), genes that defend us against invaders (Immune intelligence) and genes that sustain our life cycle (Sustainability intelligence). When we are studying the intelligence of individual actors, we can think of intelligence as a primarily evolutionary process, generating diverse kinds of simulations. 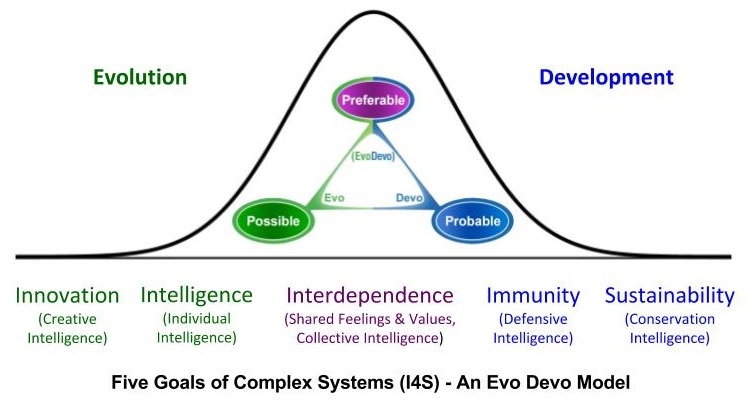 When we are studying the collective intelligence of a system of interdependent actors, as with the human species, or an ecosystem, we are referring to an evo devo process. When we are studying the defensive or sustainability intelligence of an organism, and the processes that ensure it protects itself and can navigate its replicative life cycle, we can think of intelligence as primarily a developmental process. Keep these three kinds of intelligence in mind, as they are sometimes in conflict with each other. If the universe itself is a replicating system that has self-organized to pursue all five of these goals, as I believe it may, it is in this full sense of the term that we can say we appear to live in an intelligence-sustaining, (Noetic) universe, one in which accelerating change is part of an apparent universal developmental process, and humanity and its intelligence is not insignificant, but has a set of essential purposes and roles to play. Note that sustainability and innovation can be argued as particularly fundamental to complex adaptive systems. Sustainability is engaged in information-conserving, energy-dissipating reproduction. The chemist Ilya Progogine explored this in his concept of dissipative structures as the core of complex systems. Innovation, or information-producing variety, seems equally fundamental to life. Immunity/stability of reproduction, and the simulation intelligence that accumulates as a result of growing information and variety, also seem nearly as fundamental. Once we’ve recognized these, we can better explore our highest “purpose”, interdependence, and the complex interactions and synergies, usually cooperative but also at times competitive, that are most adaptive in interdependent systems. As Stephen Friend says, accelerative social processes that are the cornerstones of modern society, including capitalism, liberalism, and technology, don’t always make for a better future. They are networks of rules and tools that can be used for social good or social ill. The Five Goals can help us greatly to think through the ethical dimensions in the use of these and other complex systems. We can ask if we can envision a strategy where all five goals are advanced, or at least, we aren’t getting more of some at the cost of others. Consider the future of human genetic modification for an example. Human germline genetic change, for enhancement, for example, is always going to be a nonstarter for us socially, because it deeply threatens our interdependence. We don’t want a multi-tier society of enhanced and unenhanced people. Germline genetic change to eliminate serious diseases, by contrast, is a way of advancing all five goals. Using genetics to make our children more similar, as could happen in a future with easy preimplantation genetic diagnosis, would fight against our species innovation goals (cognitive and social diversity). If too many people began choosing to have children with the same kinds of bodies and brains, many of us would rebel against that, as we rebel against too much social conformity today. The Five Goals help us understand why the term sustainable innovation (SI), or in a less-used phrase, innovation sustainability (IS), is a the best two-word phrase that science can presently offer us for the core purposes of complex adaptive systems like life and human society. This phrase is a paradox, as it includes two concepts, one evolutionary and one developmental, that are in tension with each other, and it is a far better description of both life’s and human society’s central purpose than either term alone. As process philosophy tells us, life doesn’t just try to sustain itself, it is always innovating, always pursuing new experiments, some of which will be adaptive. Continual innovating change and continually self-sustaining complexity (especially if the universe is destined to replicate its current complexity) are both apparently universal constants. Sustainability without innovation is sterile, and increasingly outmoded and overtaken. Innovation without sustainability will soon go dangerously off the rails. Both are interdependent with each other, and each are perennially seeking a balance with the other. Left wing politics are economically sustainable (welfare, wage guarantees) and socially innovative (freedoms, rights). These two agendas perfectly straddle our two most fundamental spheres of political interest, economics and society. I would posit that these political positions may even be universals, positions we can reasonably expect to exist on all Earth-like planets. Note that each political position incorporates accelerative thinking, but in a different sphere. If we seek to blend and balance these two perspectives, while recognizing social progress, we need another term. This Guide proposes that upwing, is an even more useful term than centrism, which is perhaps our currently most preferred term for describing a politically cooperative and integrative perspective. Upwing strategy and policy can be defined as any attempt to borrow elements of both parties agendas to find a blend of sustainability and innovation that will best generate social progress. Recall our discussion of the Five Goals in Chapter 7. In that treatment, which was a fusion of Aristotle’s triad model of the Beautiful, the Good, and the True, we argued that the three central goals on the Gaussian evo devo distribution, Intelligence, Interdependence, and Immunity, are the main goals that comprise Aristotle’s Good. In this view, the we can see three main goals that adaptive systems are steering toward, in their preferences. the two outside goals, Innovation and Sustainability, while goals in themselves, can also be thought of as the most fundamental and powerful means to the three central goals of adaptive societies. Evo devo theory tells us that these two outside goals are in the greatest continual conflict and tension with each other, as we’ve just described. Innovation (Beauty) Creativity, experiment, play, re-creation, awe, fun. Intelligence (Goodness) Personal abilities, wealth, and rights that are “freedoms to”. Interdependence (Goodness) Connectedness, love, understanding, ethics, cooperation. Immunity (Goodness) Security, stability, fairness, and rights that are “freedoms from”. Sustainability (Truth) Sustainability, science, data, rationality. The latter perspective, contrasting the five central goals with the two outside goals, can sometimes be an even more useful way to view the five goals than the one we’ve just offered, which contrasts the two left-sided goals with the two right-sided goals. Nevertheless, both perspectives are valuable, and I offer both for your consideration. I find the I4S Goals is a reasonable first draft of a set of relatively universal goals and values. Let me know if you disagree. In just a few more sections we’ll the Ten Values of Social Progress a model directly derived from the Five Goals. The additional categories in the Ten Values offer us even more dimensions to view social systems, allowing additional analytical and explanatory depth. I think Ten Values are essential survival goals for adaptive societies. Let’s look now at how the Five Goals (I4S), can be applied even to non-living complex systems, an indication of their potentially general utility, as in the origin of life discussion below. We also refer to the Five Goals when discussing natural computing and natural security, in both Chapters 7 and 8. If all the other four systems in our universal hierarchy above are also adaptive evo devo replicators, future information and physical theory will have to describe a critical version of these Five Goals in those systems as well. Let’s look briefly now at what these behaviors look like in nonliving chemical systems, and how they inform one of science’s great unsolved puzzles, the origin of life. When we think of physical-chemical systems, we find many stable replicators, like Benard cells. These are cyclic convection columns which you can see in any pot when it boils, and bubbles rise predictably to the surface in cyclic columns. We also see the tops of Benard cells in the energy-dissipating “granules” on the surface of the Sun. Benard cells are continually self-reproductive and homeostatic (immune), and they form interdependent collective networks on surfaces. There is not much intelligence or innovation in them however, so clearly they don’t qualify as life. Think now about autocatalytic chemistry, like the tricarboxylic acid cycle (TCA cycle). This is our body’s Kreb’s cycle in reverse, and it may have been common in primitive Earth environments. Again, it has sophisticated reproduction, immunity, and interdependence, but this time, it is also capable of innovation, in the kinds of chemical systems it uses in its autocatalytic loops. Consider that once the TCA cycle linked to photosynthesis, and was capable of energy storage, it could become our first metabolism, capable of storing solar energy in chemical energy, and then releasing it on demand. Smith and Morowitz argue, in their magnificent opus, The Origin and Nature of Life on Earth (2016) that this was a critical innovation on the path to life. Notice that we aren’t there yet, however. To explain how life arose, we’ll have to explain how DNA-guided protein synthesis, which itself is a replicator, connected to a self-stabilizing and energy-storing-and-releasing metabolism. DNA is a information generating, storing and processing system, and once it is connected to three-dimensional proteins that interact in the world, becomes a system capable of modeling its internal and external environment, in gene-protein language. That gets us to Behavior #2, intelligence (simulation), the last one that has so far been missing from these discussions. We’ll have to figure out how all that happened, in interdependent physical and chemical evo devo, in order to finally explain the origin of life. Again, if these Goals/Behaviors are truly universal, we should be able to apply them to the future of self-aware technology as well. My friend AI theorist Steve Omohundro has written a thoughtful paper, The Basic AI Drives (PDF) (2007), which considers what AI’s values and purposes might be from a rational economic behavior perspective. It offers one view of what self-evolved AI goals might be like in advanced AI systems “of any design”, and proposes that AI systems could easily be dangerous unless they are “designed very carefully.” An implicit assumption in his view is that human designers will be calling the shots. I think this view is wrong, and that a deeply bio-inspired, evo devo approach to AI production will be far more effective than human design, and furthermore that such an approach will deliver increasingly innovative, intelligent, moral (socially emotionally, and rationally interdependent), immune, and replicative AI systems, on the way to their self awareness. I consider these Five Goals to be at the heart of all evo devo systems. Fortunately, we’ll have plenty of time to see who is right in coming years. Generally human-surpassing and self-aware AI won’t be here anytime soon. Complex autonomous systems whose algorithms we evolved, rather than designed, and which are capable of their own replication (development) will be here very soon, by contrast. We’re already using neural networks and evolutionary algorithms. We just need to add the developmental (self-improvement) part, and we’ll be able to access an even better class of self-stabilizing complex systems, in my view. We shall see. Fortunately, even mainstream evolutionary theory is now beginning to think about human futures in not only evolutionary but also developmental terms. But a lot more work along those lines will be necessary before developmentalism (universal development) moves out of the realm of natural philosophy and complexity studies, and gains broad scientific legitimacy. We’ll get a sense of what that some of that work may end up looking like, in rough outline, in the remainder of this chapter.